Is Your Air Conditioning Contributing to Ozone Depletion? For decades now, a variety of standard household appliances have used chemicals that are harmful to the environment. This practice has been a particular problem with air conditioners. The most common refrigerant, R-22, can do a lot of damage to the ozone if it leaks out into the atmosphere. For that reason, R-22 and other harmful refrigerants are being phased out. If your air conditioning unit uses these refrigerants, then it’s time to take action. 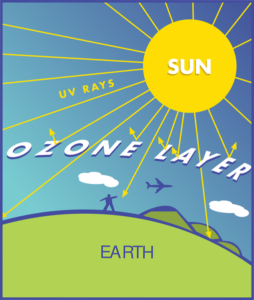 The ozone acts as a layer of sunscreen around the entire planet. Without it, the Earth would be exposed higher levels of ultraviolet rays from the sun, Instead of being absorbed by the ozone layer keeping the stratosphere cool, vastly increasing the effects of global warming. Without the ozone, we would be toast which is why governments all over the world are taking action against products which pose a threat to the ozone. As of 2020, it will be illegal to manufacture any new air conditioning units using R-22 as a refrigerant. That means any units that rely on R-22 will have to be repaired using recycled parts. Repair costs for these older units will skyrocket, and only get higher as time goes on. A more cost-effective solution is to invest in a new unit now. Not only will you save yourself a small fortune in the long run, but you’ll also be doing your bit to help the environment. There is a nameplate on all air-conditioning units, which state the type of refrigerant used. Check if yours uses R-22. If so, start planning to make the switch to a new, more environmentally friendly unit. Many brands are already moving away from these harmful refrigerants, so even before the 2020 cutoff date. R-22 is already illegal in many countries. Make the switch today, and you can keep cool without heating up the planet- a win-win situation for everyone. Contact Good Deals Heating and Cooling for all your HVAC needs. Call 215-947-1166 today.